In January, a compromised lock led to an attack on a deputy. Hundreds of jail cell door locks are not working properly -- and there's at least one case where an inmate was able to get out. Eric Leonard reports for the NBC4 News at 5. Los Angeles County is scrambling to address a major security flaw that has already led to an attack inside one of its jails. More than 1,000 cell door locks need to be upgraded at Twin Towers Correctional Facility in downtown Los Angeles as inmates have discovered how to stop some doors from latching, a problem that a sheriff's union says the county has known of since 2015. The problem, according to county purchasing documents, is that cell doors can be jammed with paper or cloth, in turn preventing the doors from latching shut, even when they appear closed. While the county says it has been working on a solution for several years, some deputies who work inside the jail's Tower Two say they didn't find out about the defect until after an attack this year. The Los Angeles County Sheriff's Department says that in January, an inmate inside a cell with a compromised lock was able to open the door and jump a deputy on the second floor of a jail pod. They say the inmate lathered himself with soap to make his body slippery, then began punching and knocked the deputy to the ground. It was after that attack that the Association of Los Angeles Deputy Sheriffs sent out a bulletin saying the county had been trying to find a fix for the last two years. "Embracing bureaucratic excuses when the safety of deputies and inmates alike is being compromised, is simply unacceptable," ALADS said in its bulletin. The Sheriff's Department says the cell locks became a problem as parts of the jail were used differently than originally designed. 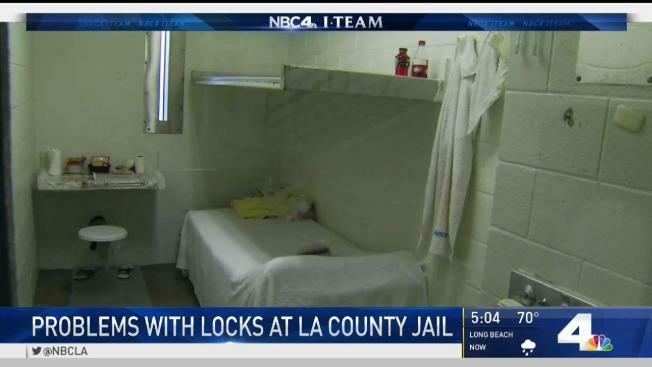 "The locks that are in question are in the cell doors of what we call a 'service' area or a dorm area," LASD Capt. Ken McWaid said. Instead of having inmates locked in their cells, these areas have been converted, with cell doors left open so inmates can go to classes, socialize and take part in rehabilitation programs. The county says it's now spending more than $1 million to buy tamper-proof mechanisms that are installed on top of the existing locks to prevent inmates from jamming them. There are 177 questionable locks that are being fixed first, the county said, adding that it will take months to fix the more than 1,000 other compromised locks throughout the jail. In the meantime, deputies have been advised to remain vigilant. "We have trained and instructed our deputies working inside these modules to treat every door as if it's unlocked and to always be on-guard," McWaid said.